Check out these Custom Teacher Quote Tote Bags for $8.95 (Retail $18.95). 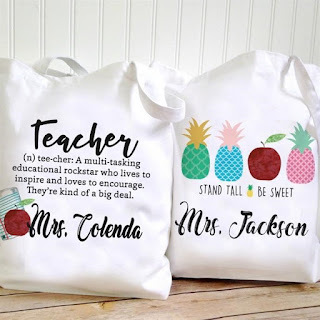 Our Personalized Teacher Totes will make a thoughtful gift for your child's teacher this year.What a great idea to use as a personalized gift bag filled with school supplies from the whole class! $2.95 for the first item and $1.95 for each additional item. US only. Ships no later than Tue, May 8.